An allegorical workbook introducing the fundamental principles and practices of cross-cultural missions. Designed for groups or individuals. Chapters contain a brief introduction, discussion of a key mission principle or practice, and an entertaining allegorical illustration of the principle. A question & reflection section gauges the comprehension of each concept. For teens or short-term mission group training. In sixty-days, Stephen teaches how to 'abide in Christ', and experience what it means to 'remain in the Vine'. 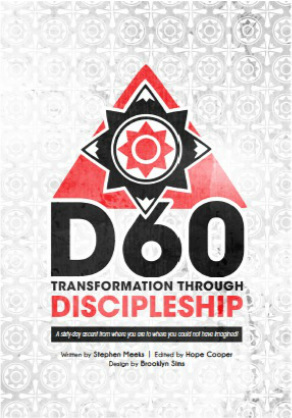 D60 is a blueprint for developing daily habits which practice basic spiritual disciplines, which allow God to transform. Join or Begin a D60 Growth group!